I spent yesterday outside gardening in the garden, and only took one picture showing Geranium x cantabrigiense ‘Biokova’ with bits of Snow-in-summer, Cerastium tomentosum, growing with it. 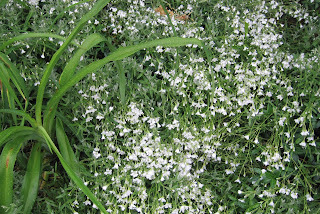 The snow-in-summer is the one with the grayish-green narrow leaves. In the lower center are the tips of the maroon leaves of Hecheura x villosa ‘Mocha’ (more on that later). In the morning I weeded out the grape arbor bed and spot weeded the other beds in the back. Around lunch time, the garden designer arrived bringing with her a sprig of a geranium that she proposed using as a ground cover in one section of the front garden. She didn’t think it was enough different to warrant buying it and pulling out the ‘Biokova’ that was already there, but wanted to compare them. We put that sprig in with the ‘Biokova’ and noted it had a slightly larger leaf than ‘Biokova’, but the blooms were nearly identical, so we decided to use the ‘Biokova’. My job was to remove the snow-in-summer growing up and through the ‘Biokova’, and then dig up the ‘Biokova’, divide it and replant it so it would in time form a nice ground cover under some yellow flowering ‘Radsunny’ Knock Out® roses. I should mention that I already had the roses, planted in a nice straight line. The garden designer’s assistant moved the middle rose forward to form a triangle with the three roses and I couldn’t believe the difference. Instead of just a mass of roses in a nice straight line, like a hedge, I could suddenly see three rose shrubs. I wonder why I didn’t think to do that? But I didn’t think to do that, which is why I have a garden designer. Did you know that geraniums (the true Geraniums, not those pelargoniums) are fairly shallow rooted? I dug them up and divided them as best I could, and replanted them around the roses, as best I could, and will hope for the best. Did you know that snow-in-summer forms a mat of roots and in time, any lesser plants will be swallowed up by it? When you pull that stuff out, the stem stretches like it is made of elastic and then snaps off. I got rid of as much as I could but I’m sure I’ll be pulling out sprigs of it here and there because some of those mats of roots remain under the mulch. I call that kind of weeding “self-inflicted”. I planted it purposefully, after all. I have snow-in-summer elsewhere in the garden, big mats of it, and it is putting on its annual “see how pretty I am, keep me” show which makes me want to keep a little of it, but try to keep it more in check. Excuse its rain-soaked appearance. 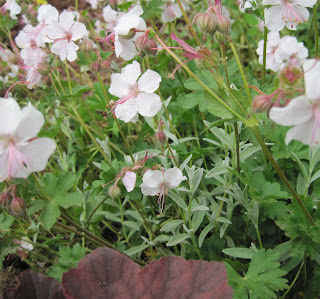 We had some rain last night, perfect for settling in those geranium divisions and the Heuchera x villosa ‘Mocha’. The garden designer brought those, along with the geranium sprig and a sprig from a smoke bush, Cotinus coggygria, probably the variety ‘Purple Smoke’. I said a quick “no thank you” to the smoke bush and she said that she didn’t think I’d like it. She is very patient with my plant prejudices likes and dislikes. When she showed me the Heuchera x villosa ‘Mocha’, it was a more definite yes. Why? Because I immediately thought those were ones my Dad would have liked because he seemed to like dark foliage like that and I think a garden should include some plants that remind us of those who are no longer living. I have those kinds of plants all through my garden. The astute reader will note that Cotinus coggygria 'Purple Smoke' also has dark maroon colored leaves, but I still don't like it, so the garden designer can't assume that I'll like any plant with dark foliage. It must be challenging to be a garden designer. She can come up with the shape of the beds and the general purpose and idea for each area. She can move existing plants just a little to make them look more interesting. But how do you figure out what the garden owner will like in plants? Or maybe it is more important to know what the owner doesn't like? Or maybe it is just more important to just keep suggesting plants? I have lots of Biokova and really like it. I also recently got a piece of another hardy geranium at a gardening class and it was indeed VERY shallow rooted but has transplanted well. I have my hat off to garden designers. Not only do they have to deal with plants, which don't always cooperate the way we want, but they have to take into account the taste of the gardener, the micro climate of the garden, the soil available, the budget available . . . It has to be a huge challenge. At least with only one of you, she doesn't have to accommodate a spouse's taste as well. Landscape designers have to be part marriage counselor, too. I love my 'Nordine Red' smokebush and so does the rest of my family. Wonderful with the setting sun shining through the leaves. I don't have 'Biokovo' but love it in my friend's garden and I think she promised me a piece. It sounds like you're making good progress. Send that Purple Smoke Cotinus to me ... not that I think it would grow here. good luck with the geranium. I tried transplanting one of mine once--it wasn't too happy! Hi Carol, I really enjoyed this post explaining about how the garden planting and choosing is going at your house. I have a lot of self-inflicted weeding at my house because of things I planted which I shouldn't. Ah well. 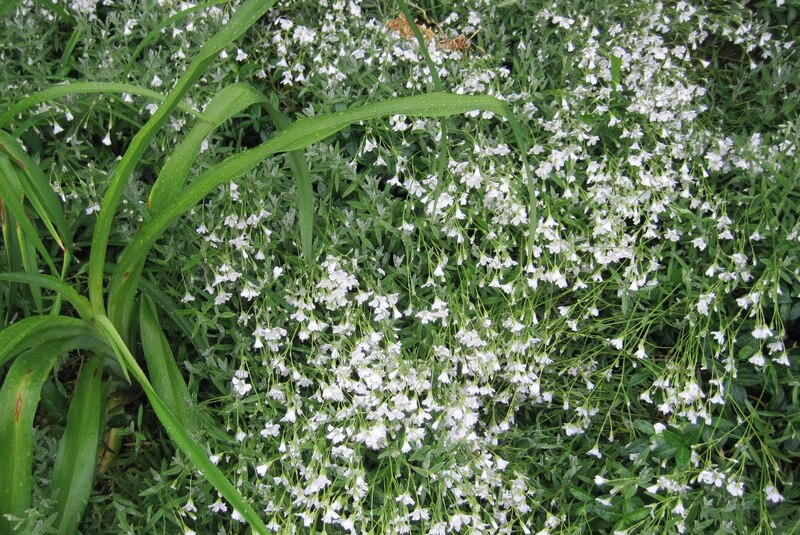 I have Biokovo growing in my front garden bed and really love the dainty little flowers. Very pretty, but was not aware they were shallow-rooted. Happy to know as I tend to move plants around a lot, but will not with this one. My yellow roses are not in a straight line, but it was not that I had any design sense. More fit in the bed if I staggered them, LOL. I am not familiar with Radsunny Knockout. It thought I had grown them all, will have to look this one up! Your garden seems to be coming along beautifully.